A large part of social media is about creating and publishing good content. The creative juices get flowing when you think of quirky brands like Skittles or even adventurous brands like Mountain Dew. But what exactly can you think about when it comes to floor cleaners and a myriad of other detergents? Apparently a lot. Social media marketers of the following brands seem to be experts in coming up with smart content in the home care industry. In this study, we looked at Bounty, Dawn, Lysol, Windex, Scrubbing Bubbles, Airwick, Febreze, Glade, Downy, Tide, Ziploc and The Honest Company during the period of January 01 – June 30, 2017. Unmetric Analyze allows you to research and identify brands with the most engaging posts, either in a specific industry or in a select group of brands. Here are a few of the top performing content pieces from the above set of brands. Just look how adorable that puppy is! No wonder the video has over 24 million views. This also proves that engaging content doesn’t need to be long or complex. It needs to have personality and be relatable. The brand had multiple posts that were creative project suggestions. DIY posts seem to be working well for CPG brands. The inclusion of a video element has only added to the engagement. 8 such one-liners from The Honest Company’s Instagram page made it to the top 10 best posts in the group. Content like this involves minimal production effort but brings in maximum engagement. In addition to their “Loads of Hope” campaign, the brand engaged with their audience using interactive content. The brand took a usability oriented approach and showcased the product in action. My favorite part is how the brand took the time out to reply to so many people that commented on the post and build a connection with them. The home care industry had a lot more highly engaging content and interesting campaigns. However, how do you create such well performing content? 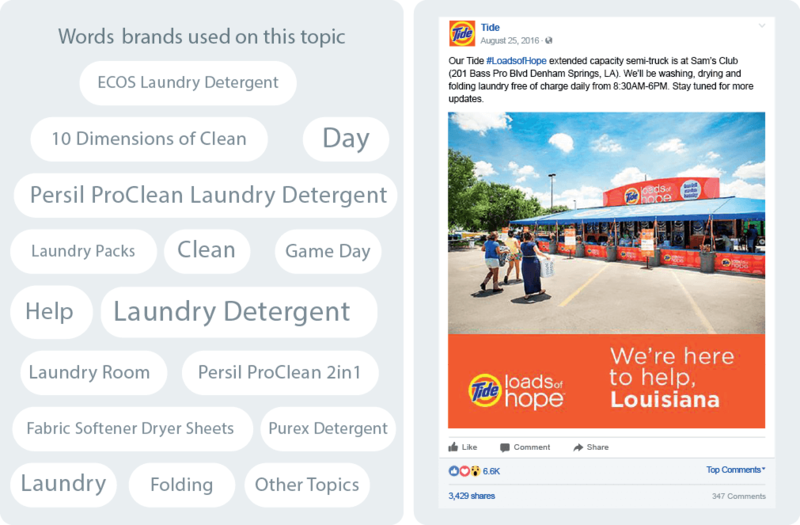 We found that “Laundry” and “Clean” were two of the most used topics. Leveraging what has worked in your industry in the past will inform your future strategy. Creating good content stems from an understanding of your own brand and your audience. For brands that have been in existence for a lot longer than social media, the medium is an opportunity to really change brand image or to simply reinforce your brand’s positioning. Interested in learning more about the home care industry? We’ll show you how to do that in a few easy steps. Request a demo and we’ll get in touch. ← Have You Met Xia?